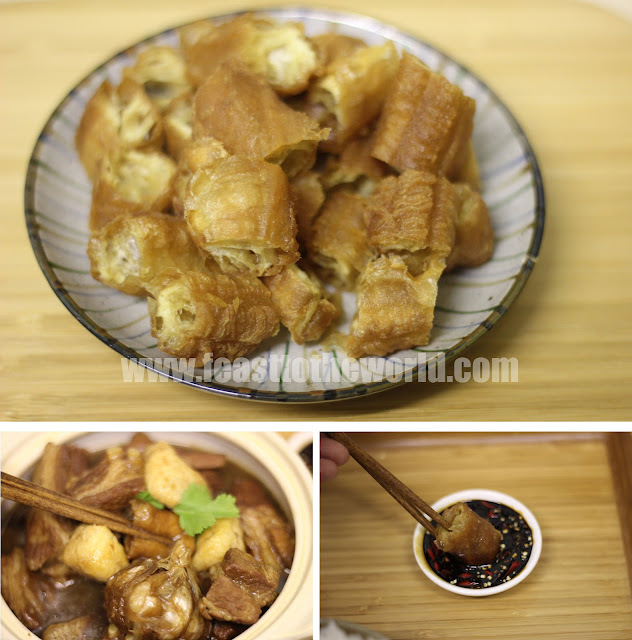 Bak Kut Teh, another childhood favourite of mine (yes, I have lots of favourites. I did grew up in Malaysia and Singapore where food are the way of life after all). Literally translated into 'Meat Bone Tea'肉骨茶, this is a dish made by braising meaty pork ribs in a Chinese herbs-laden broth, usually for hours and served with Chinese cruller/yau char kway and some steamed rice. Despite being such a hearty dish, you might be surprised to learn that it is normally eaten for breakfast. Back in Kuantan, Malaysia, my mum would normally take me to her favourite stall and this is what we would enjoy as our breakfast. We will then go to the nearby wet market and do our grocery shopping for that day's meal. 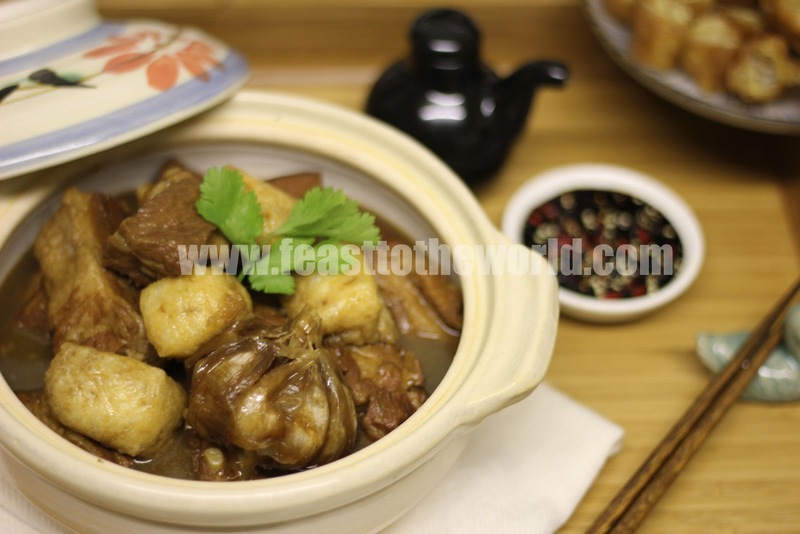 Just like the Chai Tow Kway that I have written about a week ago, Bak Kut Teh is a well debated dishes as like the former, it has a 'white' and 'dark' version. This has created a similar north-south divide in the far flung corner of Southeast Asia. The 'white' version is lighter and more peppery, due to the amount of peppercorns that goes into the brewing of the broth and originated from Singapore. The 'darker' ones, on the other hand is richer, robust and punchier due to the inclusion of dark soy sauce and this originated from Malaysia. Now you can see why I meant by the north-south divide. The fond feelings for both types by the two countries are so strong that I have a faint suspect that the causeway that separate the two nations were just the government's cunning way of preventing a full-on BKT war......of course, that was just a preposterous idea that I have in my head, but who's to say that it may not be? And just to further re-emphasise on the rivalry thing, when I was making this dish, I posted a picture of my ingredients onto the twittersphere and unwittingly, started a BKT war amongst fellow foodies. Notably Goz (of Plusixfive supper club) who represented Singapore and Yolanda (of Wild Serai supper club) who fight for the Malaysia front. The banter was intense and at the same time hilarious....each thought that their's was a better version and these went on for a couple of hours (literally the duration of my whole cooking process). There were trashy fight talks and witty friendly insults being exchanged and the rest of us were caught in the middle. In the end, there were talk of a charity match, which I think is absolutely brilliant...so watch this space. Back to the Bak Kut Teh, I have decide to go for the darker version. Despite being a Singaporean, I have more of an affinity toward this due to the childhood association and I fondly remember how I would used to dunk the yau char kway first into the rich aromatic broth, and then into the dipping sauce before scoffing it down with scoop sof rice. My mum used to have to order double or triple portion of these doughtsticks to cater for my gluttony. I was greedy child then. The secret to a good BKT is time, it need to be simmer for as long as you can in order to develop an intense herbal flavour. On this occasion, as I made it after a long day in work, I did it for the minimum two hours but a few more hours would have produced an even more aromatic broth. If you want, you can alway do it the Goz's way which I found out during the twitter war, brewed for 3 whole days! 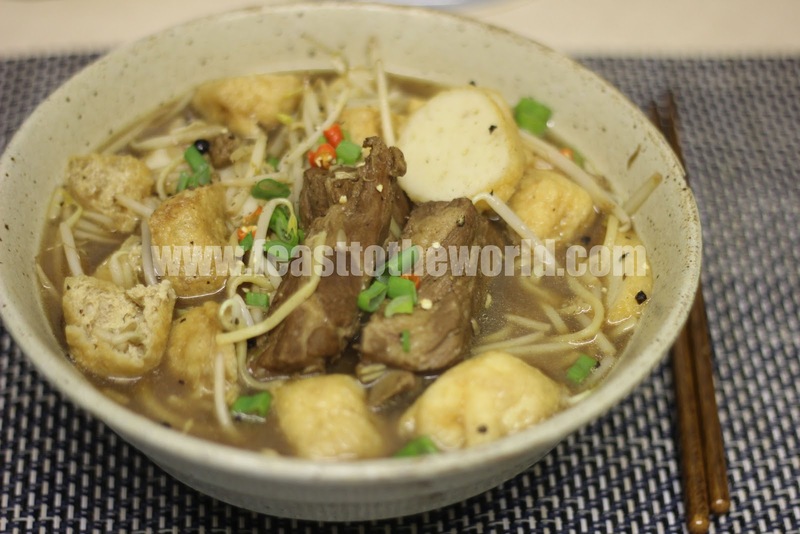 The best thing about this dish was, the leftover could be transformed into quick and easy delicious Bak Kut Teh mee/noodles the following day with some fresh egg noodles and a few additional ingredients. * Alternatively, you can easily get the ready packed Bak Kut Teh herb mix from any good oriental supermarket. The brand 'A1' does a particularly good mix, I would avoid any that are sold ready ground. Prepare the dipping sauce by mixing all the ingredients together. Place all the herb mix into the infuser ball or the muslin cloth and tie with a string to secured. Set aside. Fill a large pan with water and bring to the boil. Add the pork ribs and blanch for 30 seconds before draining into a colander. Return the now empty pan onto the heat and pour in 2 litres of water and bring to the boil over high heat. Add the herb mix, whole garlic, light and dark soy sauce, oyster sauce. Bring back to the boil, reduce the heat and simmer for at least 2 hours or longer, until the broth is well infused and taste wonderfully rich. Season with salt to taste and just before serving, add the tofu puff to heat through and serve immediately with the yau char kway, dipping sauce and some fresh steam rice. 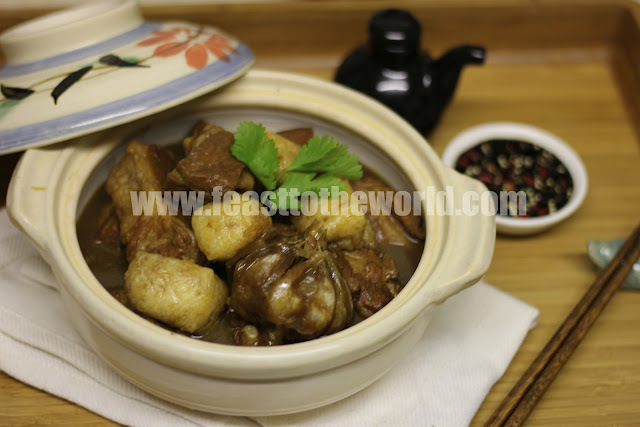 Heat up the leftover Bak Kut Teh in a pan. Add additional water so that you will have enough soup base (the volume depends on your preference, taste as you go along) Season with the soy sauce, salt and pepper to taste. Bring to the boil and add the tofu puffs, bean sprouts and fish cake, if using. Meanwhile, bring a pan of water to the boil and blanch the noodles for 30 seconds. Remove and divided into 1 or 2 serving bowls. Spoon over the broth and serve garnished with the spring onion and chilli. Am I right in saying that the Malaysian/KL herbal version has Hokkien roots while the Singapore peppery one has its origins within the Teochew community? Yes, you are absolutely right. The darker version was invented by Seng Huat of Klang in Selangor,Malayasia and was of Hokkien origins.